History: The crew of the Dark Seed, known as the Starblasters, were gathered by Skeletron, last survivor of the Black Fleet, to investigate the origins of the mysterious power source known as the Starbrand, which was responsible for his race's destruction. (Quasar#48 (BTS))- Now gathered aboard the Dark Seed, they began their search, narrowly encountering Quasar. (Quasar#53)- The trail of the Starbrand eventually brought them to earth, where they prepared to set their plans into motion. (Starblast#1)- To learn the origins of the Starbrand, Nygorn captured Uatu the Watcher, and placed him under Insidio's probes. Learning that Kayla Ballantine, girlfriend of Quasar, was the current wielder of the Starbrand, they dispatched a Moon Thruster to create one diversion, while sending Xlyym and his controlled Banari to cause another diversion on earth. The presence of the Moon Thruster drew the attention of Quasar, and many other superhumans present on earth at the time, while Threkker and Codabac captured Kayla. They were opposed by Nova, but Threkker managed to leech some of his power, and they returned with her to the Dark Seed. (Quasar#54)- Skeletron and Insidio placed Kayla into suspended animation, and the Dark Seed set its course for the Stranger's planet. (Secret Defenders#11)- The Starblasters also left behind one of their robots on earth as a further distraction. The robot, able to move at superhuman speed, was opposed by the Secret Defenders, heroes gathered by Dr. Strange. 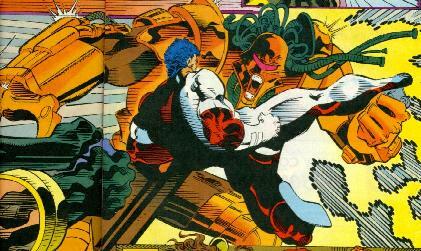 Although Nova and Northstar were unable to defeat it themselves, it was finally destroyed by the Hulk. (Namor I#45-46)- Xlyym and his Banari and Haab forces prepared to install a Planetary Thruster in earth's oceans in order to fulfill their part of the diversion. They were opposed by the Sub-Mariner, Tamara Rahn, Triton, Stingray, and Tiger Shark, who inadvertantly slew Trieste in an attempt to free her from the Starblasters' control. Learning that two Planetary Thrusters were present, Tamara, Triton, and Tiger Shark set after one, while the Sub-Mariner and Stingray set after the other. (Fantastic Four I#385)- Triton, Tiger Shark and Tamara were joined by Ant-Man, Lyja and the Human Torch, who were able to destroy the first Planetary Thruster thanks to Lyja's knowledge of its systems. The Sub-Mariner and Stingray were joined by the Invisible Woman and Thing. The Thing was possessed by one of the Starblasters' Skullhuggers, and attacked the Sub-Mariner. (Namor I#47)- After freeing the Thing from the Skullhugger, the heroes set after the Planetary Thruster again, opposed by members of the Banari along the way. The Planetary Thruster was finally destroyed by the Haab Zun, who sacrificed himself to destroy it. (Fantastic Four I#386)- Xlyym contacted Fabrikant to inform him of his failures, but announced that he would attempt to cause another distraction by generating a tidal wave with his vessel. Although the Starblasters no longer required his diversion, they approved of his plan. Before Xlyym could start his tidal wave, he was fired upon by the Stealth-Hawk, the Fantastic Four's vessel. The heroes saved Xlyym from his ship, but only so that Tamara could execute him herself. (Starblast#2)- The Starblasters, having realized that Quasar was on their trail in a Shi'ar vessel, set up a warp-mine in an attempt to destroy them while they continued to the Stranger's planet. At the Stranger's planet, they presented Kayla to the Stranger, who was intrigued by their acquisition. (Quasar#55)- While the Stranger studied the Starbrand, Skar and Codabac wrestled with each other for the amusement of their teammates. Nygorn was disgusted with their behavior, and convinced Zardok to join him in exploring the Stranger's world. Just then, Quasar's team of heroes arrived, and were immediately detected by Fabrikant, who warned the other Starblasters. 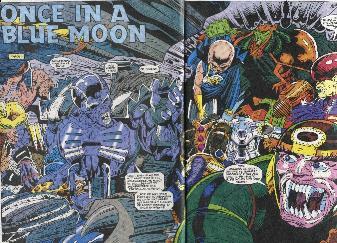 The Starblasters fought the heroes in a ferocious battle, during which Perun slew Zardok, and Threkker slew Vanguard. (Starblast#3)- At the sight of Vanguard's dead body, Darkstar lashed out in anger and seemingly slew Threkker. It was only due to an all-out assault by Nygorn that the heroes were finally defeated, and were turned over to Insidio. Meanwhile, Uatu had escaped Insidio, and witnessed the Stranger's acquisition of the Starbrand from Kayla, while Quasar battled Skeletron. Using the power of the Starbrand, the Stranger brought his entire world into the New Universe, so that he could study its origins up close. (Quasar#56)- The heroes being held by Insidio were set free by Black Bolt, and continued to battle the Starblasters. Determined to rid his ship of them, Skeletron ejected the part of the Dark Seed they were in, stranding Codabac, Insidio, Skar, and Nygorn as well, leaving only Skeletron and Fabrikant on board. Skeletron then determined that he would absorb the Starbrand energy of the New Universe into himself. (Starblast#4)- With the exception of Quasar, the heroes of earth were controlled by the Stranger to assist him against Skeletron's treachery. He set them against the heroes of the New Universe, who had invaded the Dark Seed alongside Quasar. As Skeletron and the Stranger battled, the Stranger brought the New Universe's earth and his own world into the regular universe, then teleported Skeletron back into the New Universe, stranding him there. (OHotMU 2006 A-Z#10 - BTS) - Without a leader the Starblasters were soon captured by forces of the Intergalactic Council. (Maximum Security#1)- Insidio, Threkker, Skar, and Nygorn were among the aliens exiled to earth during the so-called "Maximum Security" event. The four of them fought the Winter Guard in Russia together. (OHotMU 2006 A-Z#10 - BTS) - The Starblasters were released from Earth when the Intergalactic Council reversed the plans to make Earth a prison planet. Comments: Created by Mark Gruenwald, Glenn Herdling, Ron Marz, Herb Trimpe, John Heebink, Geof Isherwood, Tom Grindberg, Ralph Cabrera, David Day, Dan Day, and Mike DeCarlo. The Starblast crossover was conceived of by Mark Gruenwald as the means to spin-off a new series entitled "Star Masters". Aware that his Quasar title was suffering from low sales, Gruenwald hoped that by raising interest in Quasar via Starblast, the Star Masters series would be a sure thing. Unfortunately, Starblast was a mess, and completely derailed his plans for Star Masters (which finally materialized 2 years later). Starblast is simply one of the most terrible crossovers ever produced. The Namor/Fantastic Four/Secret Defenders issues barely tie into the main event at all, completely missing the point of a crossover-- to get people to pick up titles they don't normally get. No one reading Fantastic Four needed Quasar to understand the story, so why bother? The main Starblast mini-series itself featured a different artist every issue, none of them producing work that could be considered anything better than shoddy, and the finale in Starblast#4 is wrapped up so quickly that one suffers whiplash. Also annoying is that the covers of the tie-in books did little to help readers in understanding which order to read the series in. Each cover featured the "Starblast Crossover" logo, but the numbering was seriously confusing. The actual issues of Starblast didn't have numbers on the cover, period. They got an entry in OHotMU 2006 A-Z#10.